At one point or another, we've all probably been told that "Consistency is Key." Unfortunately sometimes we need to be reminded of that lesson. In the case of this blog, that was my failing. I will endevour to keep it from happening again. Part of my problem is that if I didn't think the material was good enough, then I wouldn't post it. This became a self-fulfilling prophecy as my life got more and more busy. I would write for the blog, only to read it later and scrap the written material, even if the lesson was valid. After reading other blogs, researching about keeping up with blogs, and even thinking about it myself, I've learned that quality is an issue, but not posting at all is more of an issue. If you post nothing, then the blog isn't anything. So from now on, the first goal is consistent postings, followed by quality postings. That may mean that some of my postings will be less thought/flushed out than I like, but I will post and not get behind again. CONSISTENCY: The silent C in C4. Looking back, this may be one of the most valuable and least recognized lessons of Tetris. Over time, your mistakes pile up (inside the minds of those around you), but the accomplishments are forgotten. It is sad, but true. This means that you need to be constantly accomplishing things in order to prevent the mistakes from stacking too high. 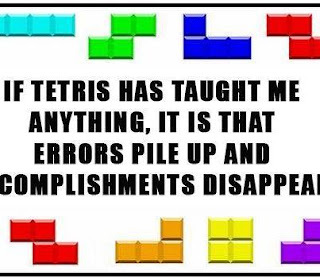 Well played, Tetris. Well played. Greetings my friends! It has been a long time. 1. I still find myself wanting to share my leadership experiences and thoughts. I am constantly offering advice in the real world, and in many cases need a place to write these thoughts down before they disappear in the ether of the rapid world we live in. 2. I am speaking at many new functions (conferences, training events, seminars) and I need an online presence I can point people to. I want this location to become not just a blog, but also a place people can eventually come to see my presentations, perhaps get copies of the slides, or ask me questions. 3. I need an outlet. I enjoy writing, but it sits in notebooks or word documents on hard drives in closets. It needs to find it's way out, and I am hoping that this blog will be a starting point. In the end this is supposed to be helpful, so I am hoping to add some interactive content and get some of the readers involved. In the long run I am excited to get back to the blog, and I promise that the content will be more consistent and (hopefully) interesting!